Viewers favor storytelling ads with remarkable visuals and uplifting messages. This past quarter was marked by several tragedies, but also a fair amount of triumphs and awe-inspiring moments. The solar eclipse fascinated millions across the US and influenced several brands to create ads that tied in with this natural phenomenon (find out how these ads fared with viewers here). However, with all its beauty, mother nature showed us she still has a destructive side. Between Hurricanes Harvey and Irma, numerous wildfires, and political tensions, viewers needed a break from these turbulent times. Instead, they wanted reminders of the kindheartedness and compassion that still lives in most of us, and of the differences people can make in the world. Brands among the Top Breakthrough Ads delivered just that, while also inspiring creativity and imagination. 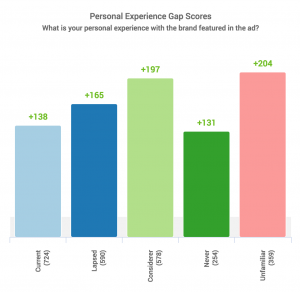 Below are Q3’s top ads ranked by Breakthrough performance, which combines the Attention and Likeability component scores. These are the best of the best, achieving Breakthrough levels recorded by less than 1% of all ads. The top two ads share philanthropic messages focused on either preserving the planet or helping those in need. These ads portrayed compassion and kindheartedness in an uplifting, inspiring manner. 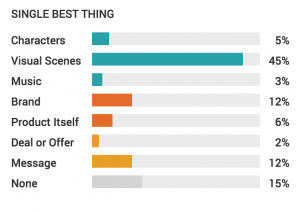 Nine of the top ads evoked viewer responses with “Great” terms, such as “amazing,” “interesting,” and “wow!”. Walmart’s “Donation Support” is the only ad in the top 10 that pulled heartstrings more than any other emotion. SeaWorld Parks earned the Top Breakthrough spot with its testament to protecting the ocean and saving different sea creatures from extinction. “From Park to Planet…We’re on a Mission and it’s BIG” ranks as the single highest rated travel ad in the Ace Metrix database, which dates back to 2010. Viewers were moved by the powerful message, which was reinforced by beautiful visuals. After dealing with a tarnished reputation in recent years, SeaWorld successfully demonstrated to most viewers that they are committed to making a positive impact on this planet. 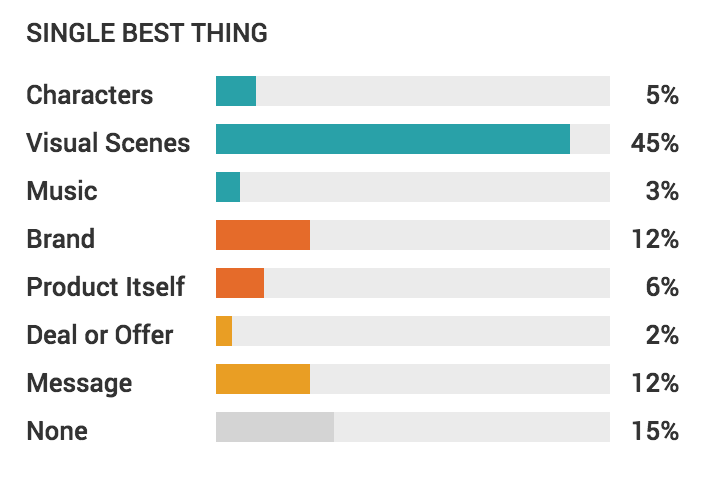 “From Park to Planet” outperformed advertising norms across all user groups, as depicted in the chart below. Coming in a close second, Walmart’s ad, “Donation Support,” shows photos from Hurricane Harvey’s aftermath. While the images are shocking and saddening, they show people coming together to help one another. Almost a tie for the Single Best Thing about the ad, the visuals and the message work together to encourage viewers to take action and help out any way they can. Due to the ads topical nature, Walmart saw the highest attention score among all ads in Q3. General Electric and Canon celebrated ingenuity in their breakthrough spots. Both ads are a longer format which tends to promote and reward strong storytelling. Coming in third, General Electric and BBDO NY’s ad, “Meet Molly, the Kid Who Never Stops Inventing,” tells the story of a clever, young girl who starts inventing streamlined mechanisms to complete chores and ends up pursuing a career with GE. 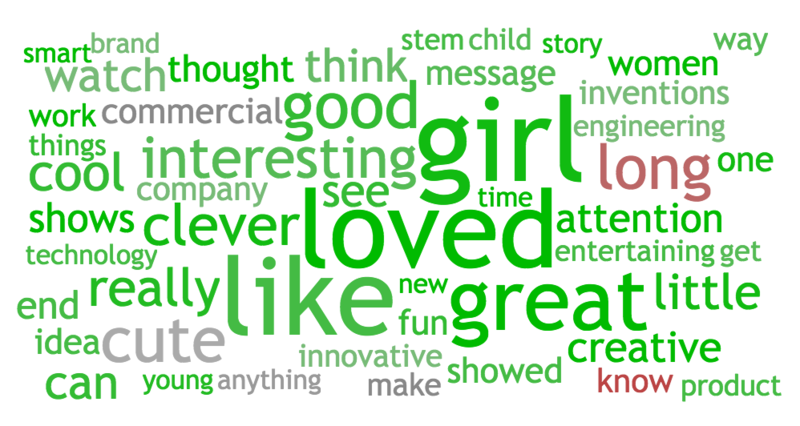 Second-by-second trace shows General Electric was able to keep viewers of all ages and genders engaged with the 1:30 ad. 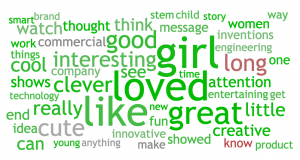 The viewer’s voice in the word cloud below reveals that the entertaining inventions and curiosity to see what might come next overcame the ad’s length. In “Perfect Moments,” Canon and Grey New York built an elaborate Rube Goldberg machine to illustrate the camera brand’s message that, “The right place at the right time means nothing without the right camera.” This cutting remark directed at smart phones and the intriguing sequence of events successfully created desire among viewers — 62% of whom reported positive purchase intent. Subaru’s “Welcome to the Pack” shares a relatable, heartwarming story that was very well-received by Millennials. 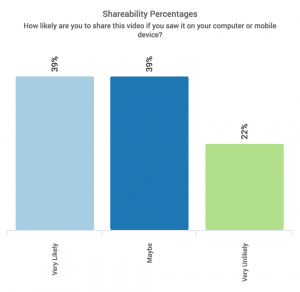 Excellent emotional storytelling in the ad led to very high sharing potential, with 78% of viewers indicating they might/would very likely share the ad. Together, a mother and son face a challenging obstacle in the road ahead only for viewers to find out what appeared to be real life is actually the duo playing with a set of Hot Wheels in Mattel’s ad, “Find A Way.” The mother is teaching her son a life lesson to persevere through life’s challenges. However, the message was overshadowed by the exhilarating scenes, which was ranked the top single best thing about the ad. The exciting visuals convinced many viewers that playing with Hot Wheels can be fun at any age. The ad resonated significantly above Toy industry norms across all age groups, and even among households without children. University of Phoenix shares an inspirational story with a big reveal at the end in “Carmen’s Story.” Aside from high breakthrough capabilities, information provided in the storyline is a key creative driver for this ad. The relevant message resonated the most for those considering enrolling at a college or university in the next 18 months. Scores were significantly above Education advertising norms for this market. Did the Solar Eclipse Do Anything for Brands?